Z in right field, ANT : in Exergue. Minted at the 7th officina (Z) in Antioch (Antakya, Turkey) in 306 A.D.
Sutherland, C.H.V., "Roman Imperial Coinage", Volume 6 (RIC), Antioch, p624, nr 74b. hinterlassenen Sammlung und Aufzeichnung des Herrn Paul Gerin" (Voetter-Gerin), Antioch, Galerius, p38, nr 17. 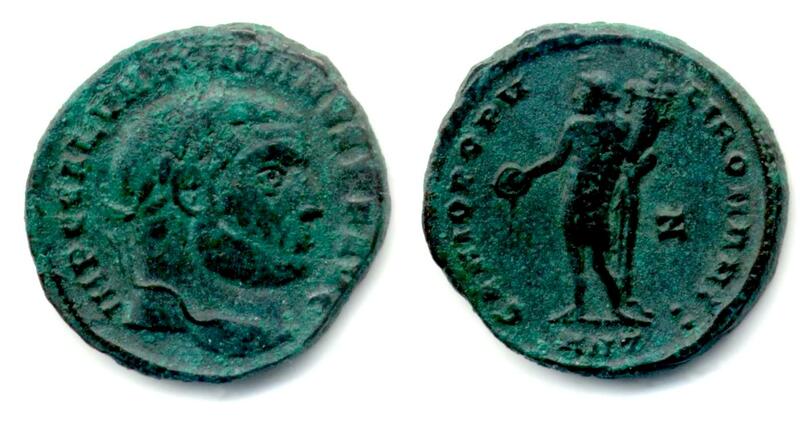 Van Meter, D., "Handbook of Roman Imperial Coins", p281, nr 29,30., variety with unlisted obverse legend. This coin was once part of the Northern Sinai hoard, found around 1965 "at a tel just to the west of the village of esh-Sheikh Zuweid.